Welcome to the world of DIY Illumination! Make many different paper-based projects that light-up in cool and surprising ways, as you learn circuitry basics through crafting with LEDs, copper tape, and coin cell batteries. Building on a starter paper circuits project, experiment with more advanced techniques like creating a DIY switch or making a parallel circuit with multiple lights. Explore more ideas, materials, and projects such as glowing pinwheels, light up helicopters, and pop-up cards. Have fun and get creative to light up your world however you want! For our starter paper circuits project, let’s design a light-up greeting card. Explore how to make a simple circuit that lights up an LED on a piece of paper. To begin, give one LED light and a battery to the campers. Encourage them to explore the look and feel of these materials and share what they notice. Then, ask them to try to make the LED light up. Notice that the battery has a symbol on each side. One side has a plus (+) sign,which stands for the positive terminal. The other side has a minus (–) sign, which stands for the negative terminal. The LED also has positive and negative terminals. The longer leg is positive and the shorter one is negative. To make the LED light up, connect the negative side of the battery to the negative leg of the LED and the positive side of the battery to the positive leg of the LED. You may want to try starting with very little instruction. Allow the makers to jump in and try to make it work. Moments of “failure”—when things aren’t working as expected—can present you with opportunities to encourage persistence and allow makers to practice problem solving. Once everyone is able to make their LED light up, introduce this basic layout that they can use to make their circuit on paper. You can hand out printed copies, or you can draw the diagram on a board for everyone to refer to when they are making their own. *Safety Tip: The edges of the copper tape are sharp, so be careful not to cut your fingers! Below are the steps for making the paper circuits, which you can use to help guide the makers. Take a piece of paper and on it, place copper tape so it follows the lines in the diagram. To make turns, tape until you reach the corner where you want to turn. Then, fold the tape to turn the corner. An electrical circuit is a path on which electricity flows. The copper tape , which conducts electricity from the battery to the light. Take the LED and spread the legs so that they are sticking out to each side. Place the LED on top of the copper tape, so the legs touch the tape. Then secure them in place with clear tape. Place the battery negative (–) side down, where the circle with the (–) sign is. It should touch the copper tape. Next, fold over the corner of the paper so that the tape going to the positive (+) circle touches the battery. Your light should turn on. Use a binder clip to hold the circuit in place. If the light doesn’t turn on, check that the copper tape is running to both sides of the battery and the LED with no breaks, and that the two tape lines don’t touch each other. The circuit needs to be complete to turn the light on; make sure there are no breaks in the copper tape. Check to make sure that the top of the copper tape is connected, even at the corners. Check the direction of the LED light; make sure that the negative end is connected to the negative side of the battery and that the positive end is connected to the positive side. Check for any loose connections. You can show examples of other types of circuits, such as a circuit with a switch or more than one light. To add a switch, make a break in the circuit by removing a piece of the copper tape. Then, add a way to connect the two parts with something conductive, such as by putting a piece of foil on your finger or by adding a flap of paper with copper tape on it. Parallel circuit: To make a parallel circuit, add the lights so that each has its own row. Make sure to connect the positive ends of all the LEDs to the positive side of the battery. Series circuit: To make a series circuit, place the lights in a single loop, connecting the positive end of one LED to the negative end of the other. For a series circuit, you need more batteries to power more lights—one for each light. Look at these inspiring light-up paper based projects designed by makers around the world. You can also share your projects and experiences with other maker campers. How was the experience of making things light-up? What was the favorite material that you used today to design your circuit? What are some things that you want to change or add to your paper circuit? Can you list three things that you want to make using the techniques you learned today? Now that you’re finished making with paper circuits, share your projects with other campers on our Google+ community and your other social media sites, always using #MakerCamp! Your safety is your own responsibility, including proper use of equipment and safety gear, and determining whether you have adequate skill and experience. Power tools, electricity, and other resources used for these projects are dangerous, unless used properly and with adequate precautions, including safety gear and adult supervision. Some illustrative photos do not depict safety precautions or equipment, in order to show the project steps more clearly. Use of the instructions and suggestions found in Maker Camp is at your own risk. Maker Media, Inc., disclaims all responsibility for any resulting damage, injury, or expense. 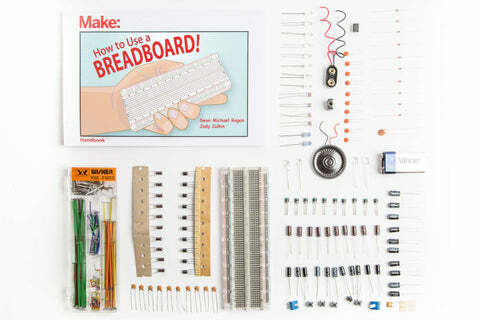 How to Use a Breadboard! 12 great projects guaranteed to spark your imagination and get you making. 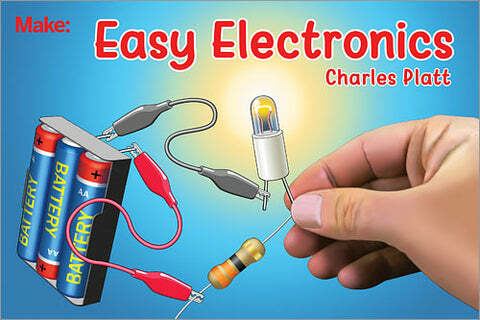 Enhance your electronics skills with this self-guided learning course. 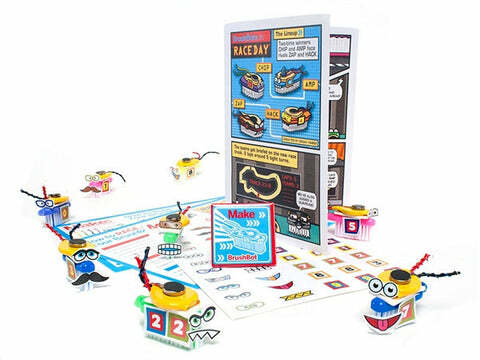 Brushbot Party Packs (12) are the perfect way to electrify your next party. Our exclusive kit has been used to teach tens of thousands of people how to solder. Make: is the voice of the Maker Movement, empowering, inspiring, and connecting Makers worldwide to tinker and hack. Subscribe to Make Magazine Today! Sign-up for updates on Maker Camp projects!